If you have ever had the chance to go to Europe, one of the best traditions I think the English have is their tea times. 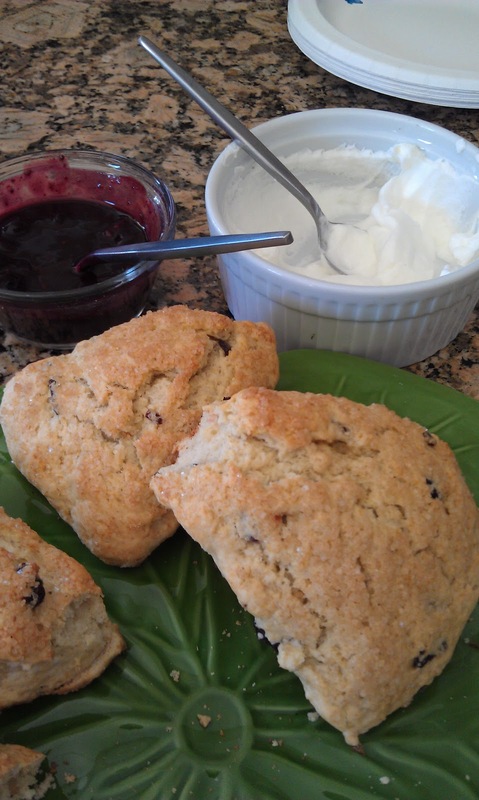 A English Teatime usually consist of a nice loose leaf tea with milk and sugar and then a plate filled with sweet scones and savory sandwiches served in the afternoon. But you do not have to go Europe to try a good English high tea, most large US city offer a high teas(hotels is a good source to check your area). 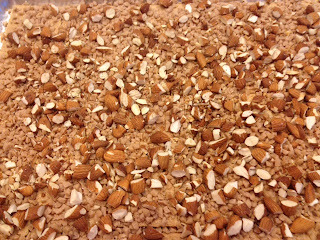 This brings me to the inspiration for this week’s recipe. I recently attended a high tea with one of my best friends. We had a wonderful time. They had these amazing scones made in a heart shape served with a raspberry jam and clotted cream. 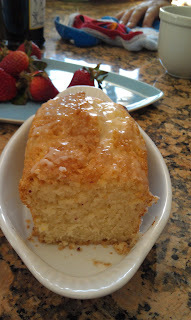 If you ever happen to be in the San Juan Capistrano area in California make sure you stop by for a nice treat at The Tea House Restaurant http://www.theteahouseonlosrios.com/. 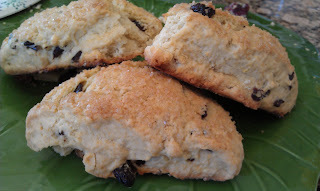 Anywise, I couldn’t get the scones of o my mind, so I decided to experience with a recipe I found and bring High Tea home. And Walla! Exactly what I wanted and the flavor is amazing. Sweet and Tart, these Cherry Lemon Scones have just the right amount of sweetness, and are light and fluffy. The sugary crust as just enough crunch factors! 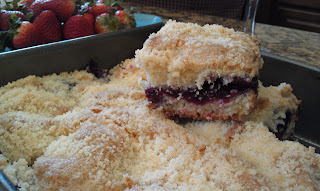 I served them with some homemade blackberry-raspberry jam and sweeted whipped cream. Since I was attending a Sunday brunch I brought the scones and a few other breakfast breads. 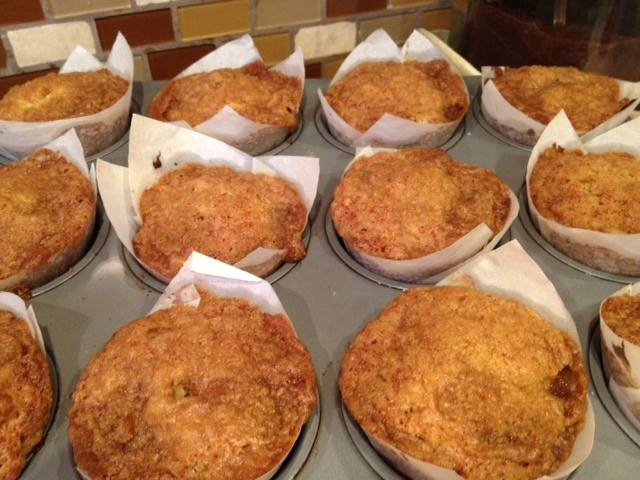 I was definitely in the baking mood this weekend. Once I start, sometime it is hard to stop since all the ideas start rolling. 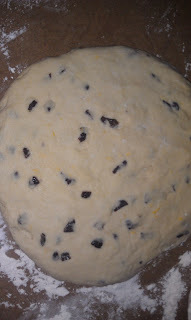 I also made a blackberry Coffee cake and a lemon bread. 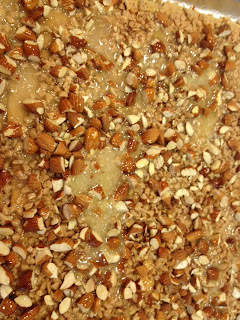 I am sharing the pictures below; if you would like any of these other recipes before the next posting, just email me. I will gladly send them. 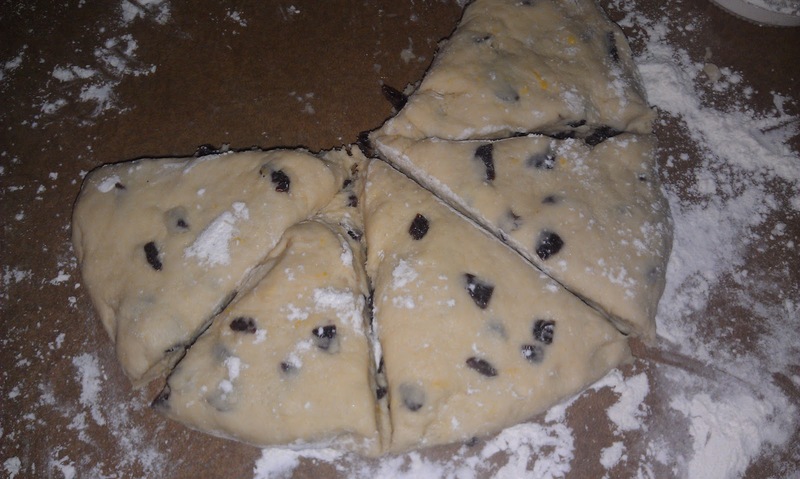 ½ cup of dried tart cherries, snipped into small pieces. 1. Preheat oven to 400 degrees. 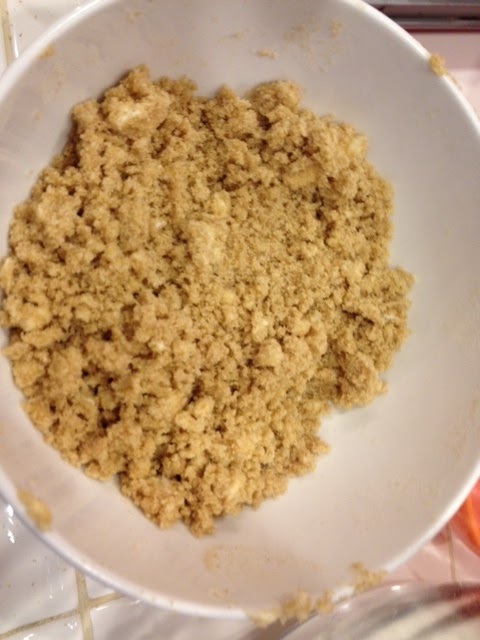 Combine flour, sugar, and baking powder, salt and lemon zest in a large bowl. Mix with whisk (or , I used the whisk attachment on the kitchen aid. 2. 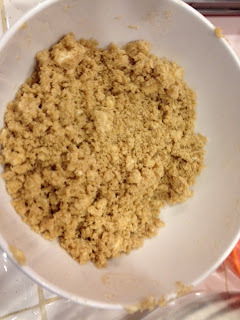 Using a pastry blender cut in butter until mixture is a course crumb ( I used the kitchen aid on HIGH, about 2-3 minute). 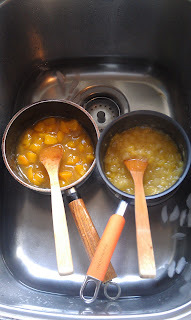 Once the right consistence, make a well in the middle of the bowl and set aside while you work on your wet ingredients. 3. In a medium size bowl, mix together eggs, whipping cream. 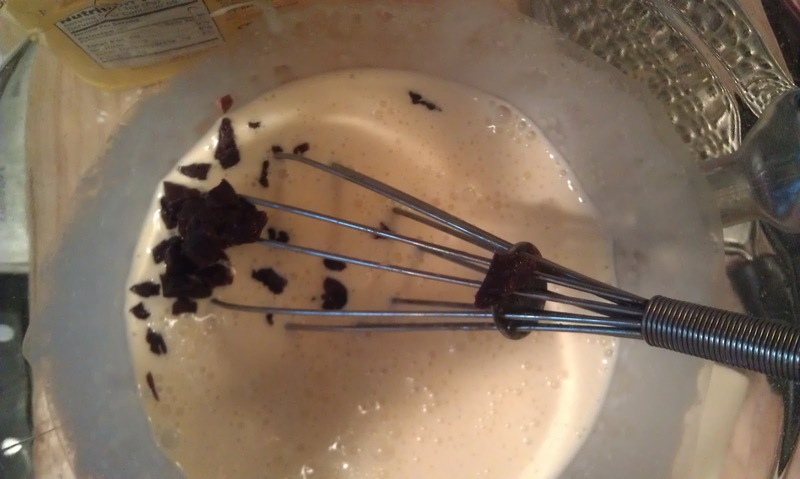 Now stir in the cherries. 4. Taking the egg mixture put it into the well of the flour mixture. 5. Stir the egg mixture into the flour using a fork. 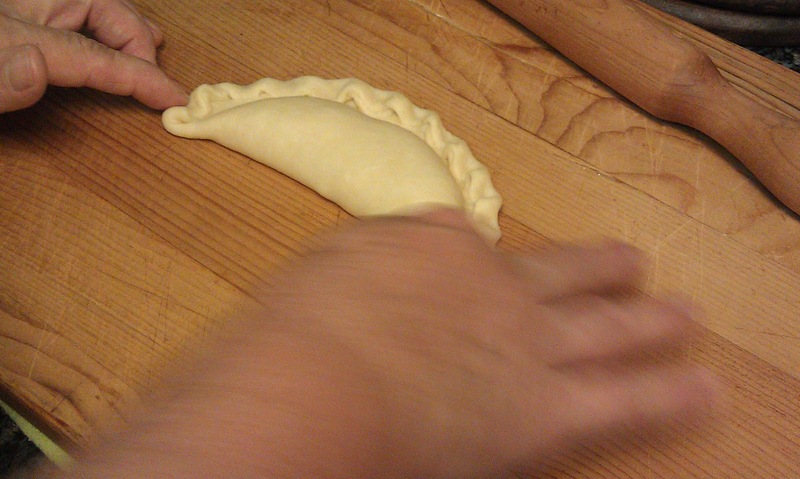 Make sure to only incorporate the wet into the dry. The object is not to over mix. 6. 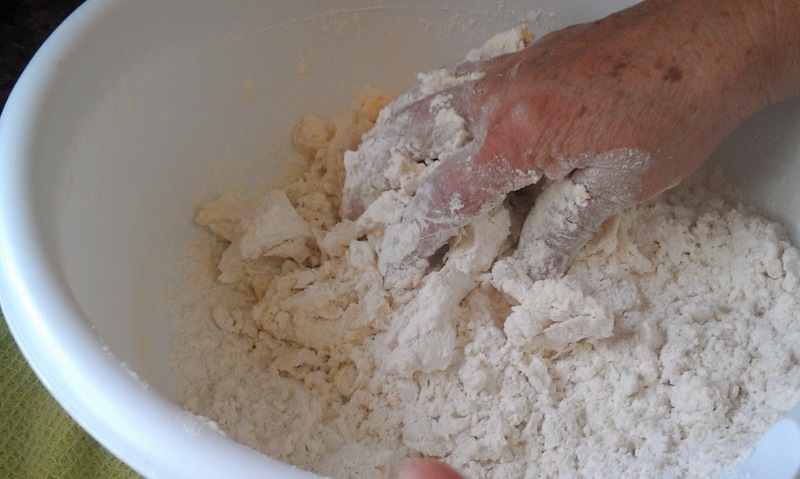 Take dough and put on a lightly floured surface. 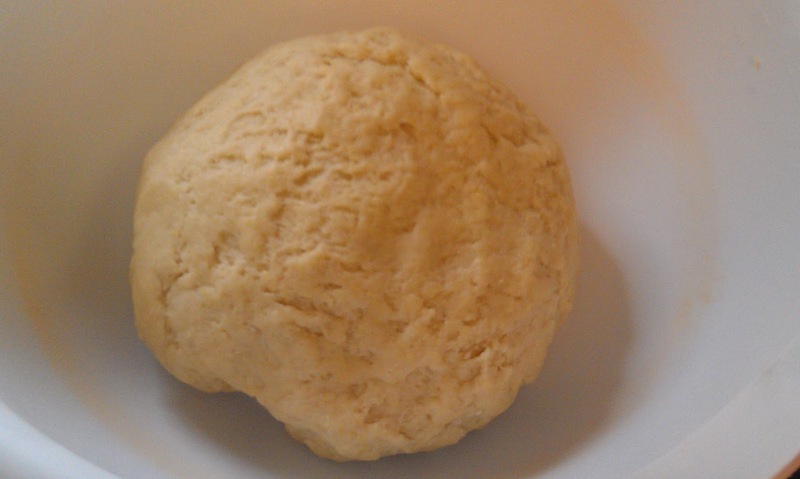 Knead dough gently for about 10-12 strokes, pressing dough down after each stroke . (Since I think the kitchen aid is the best invention ever made for baker, I left the dough in the kitchen aid bowl, put on the knead attachment ((the one that looks like a hook)) and kneaded the dough for about 10-12 turns. 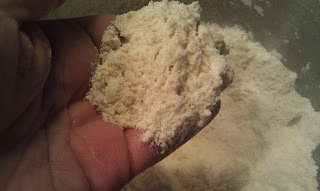 I then transfer the dough to the floury surface and kneaded it just one time). Pat the dough down to form a circle. 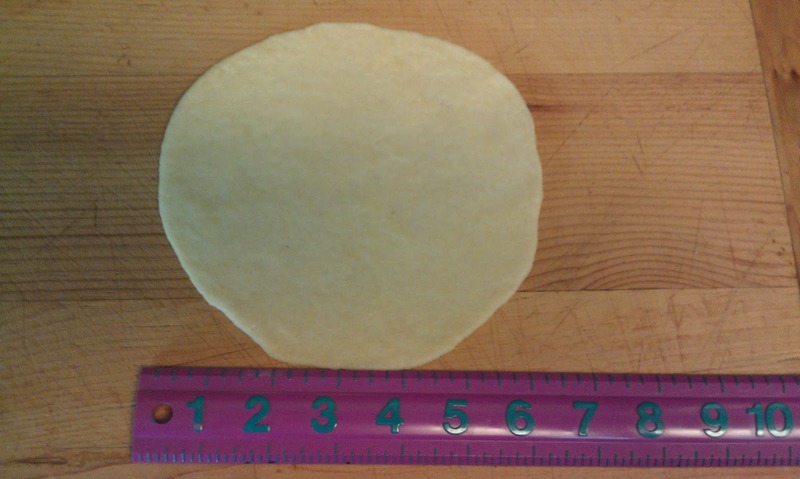 You want the circle to be around 8 inches (size of a standard cake pan). 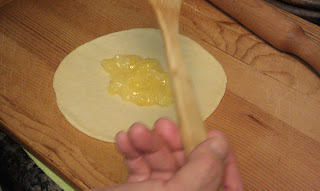 Use a rolling pin if you need to, but the dough is pretty flexible so I didn’t need the rolling pin. 7. 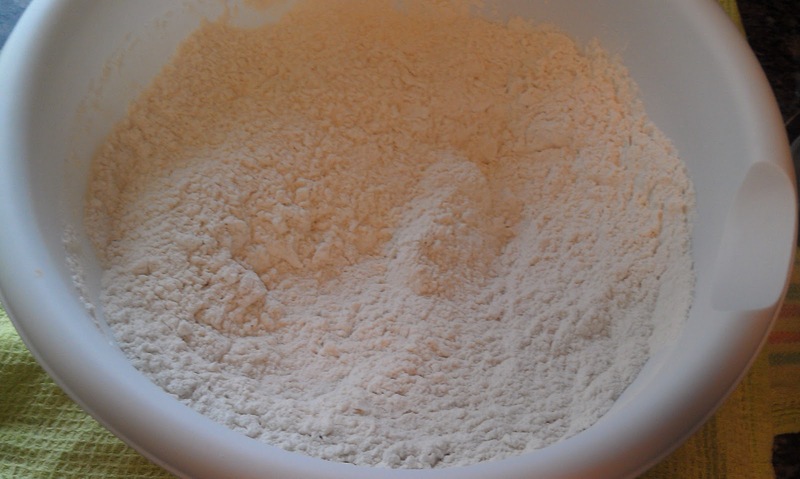 Flour a large knife. 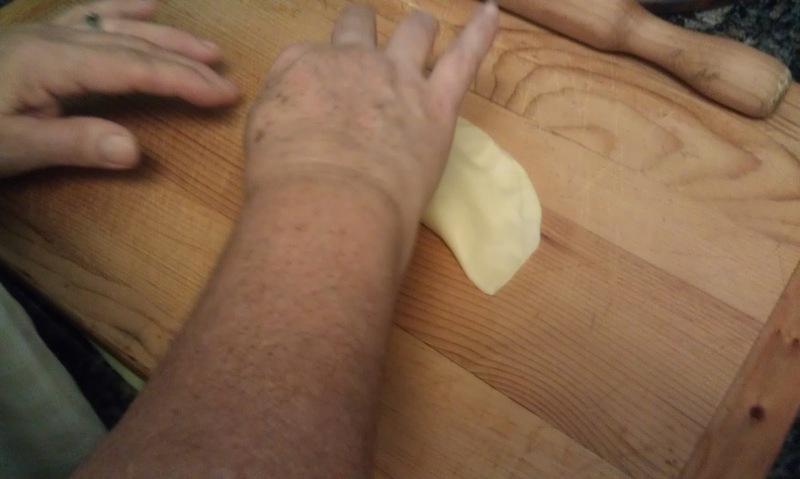 Cut dough into 8 wedges. 8. 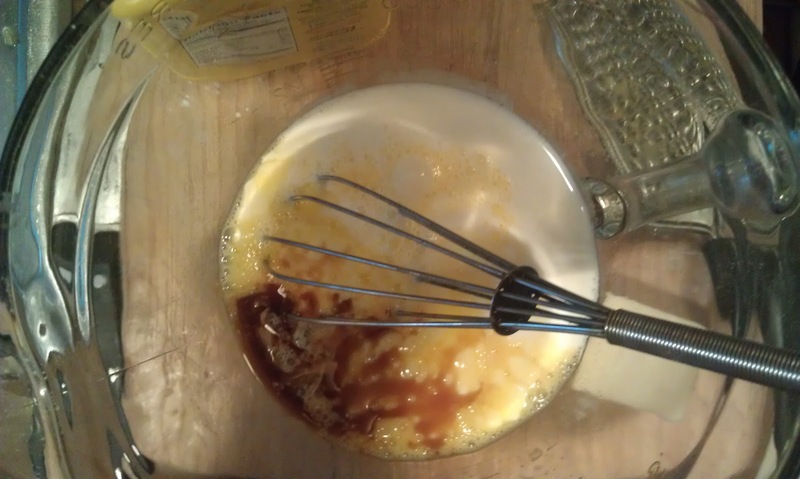 Place on an ungreased cookie tray and brush with milk. Sprinkle the Turbinado sugar on each scone. 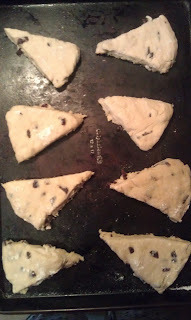 I used about 1 tablespoon per scone. 9. Bake for 12-14 minutes at 400 degrees. 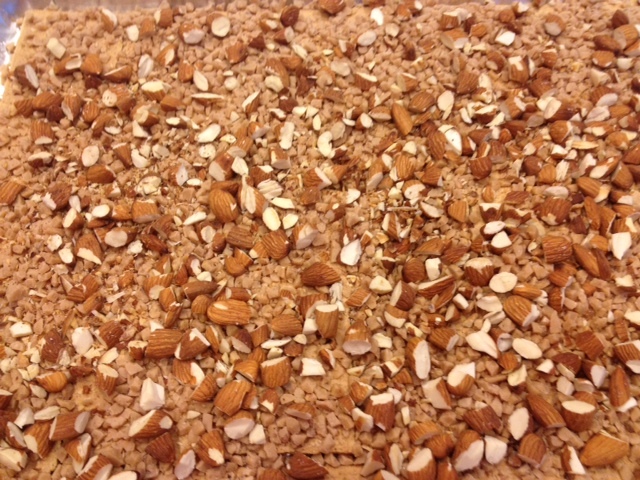 Remove from cookie sheet. Serve warm with jam and whipped cream. Butter is good too!! 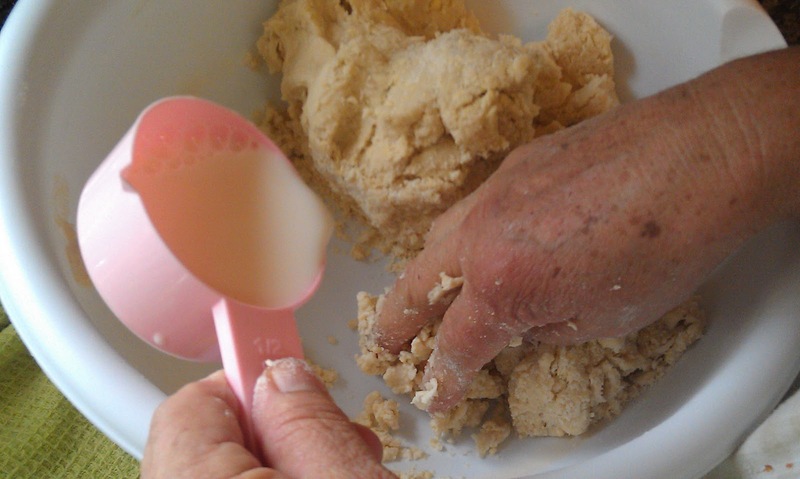 I know all of you foodies like me have a few special recipes your mom, grandmother or auntie has made that makes you just salivate at the name of it. 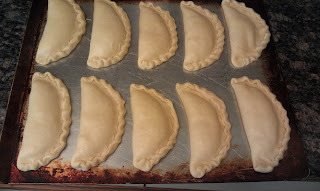 Well, that is how it is for me with my mom’s empanadas. 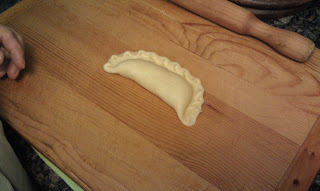 Empanada is a Mexican term for an American turnover. 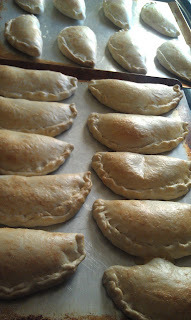 As a kid, it was a special day when my mom made empanadas which can be filled with numerous fillings. 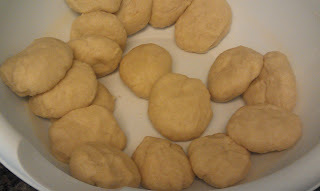 Traditionally in Mexico, they are made with calabaza (pumpkin), but there are a lot of variations. My favorites are my mom’s Pineapple or Peach Empanadas. The filling is sweet and tart, while the pastry has mild butter taste. I was luck today to spend the day with Mom and get her recipe to share with you all. 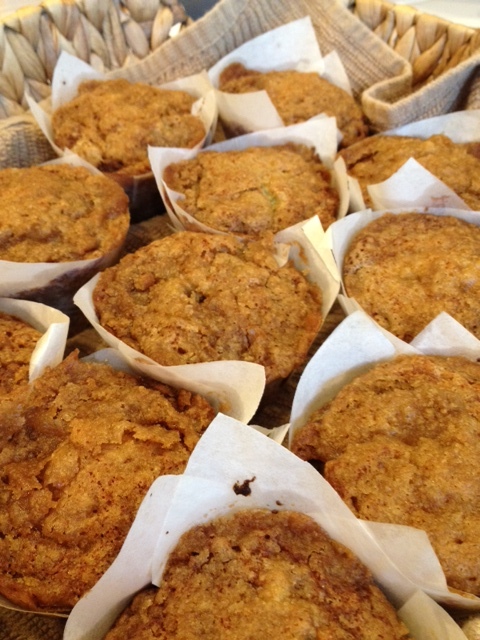 I guarantee you will not be able to eat just one. Happy cooking everyone! -In two small sauce pans over medium heat, pour the contents of the crushed pineapple into one sauce pan and the contents of the peach pieces into the second pan. -pour cornstarch mixture into filling. Mix. 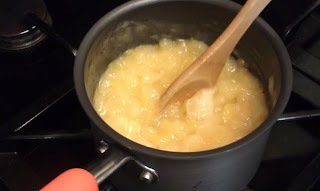 Continue to cook for an additional 2-3 minutes until its thick. 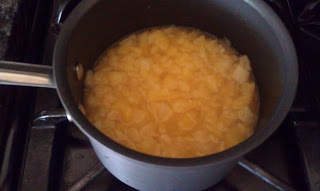 -remove from heat, cook in ice water for 30 minutes and then remove and put aside. 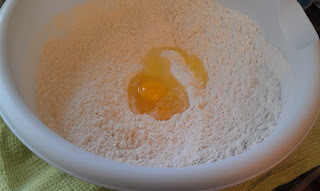 -add both eggs to the center of the bowl, using your fingers, mix eggs into the flour. 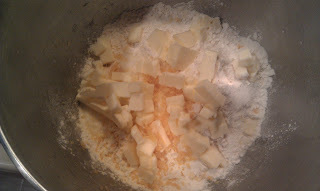 - add soften butter to the center of the bowl. 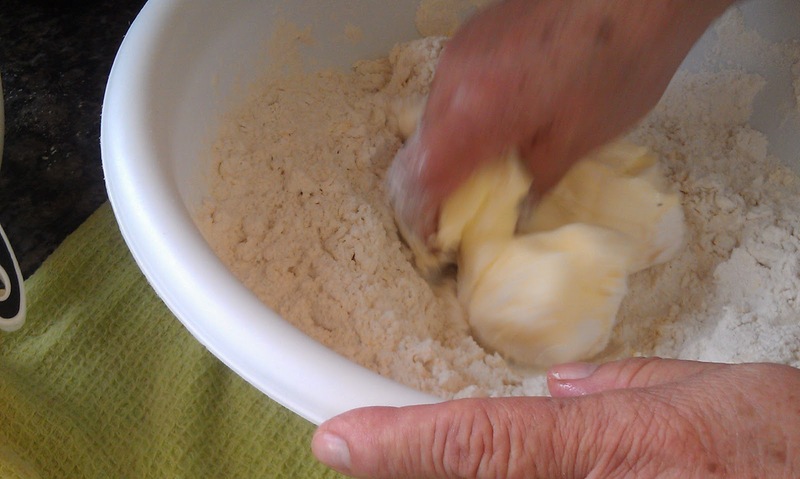 Using your hands, mix butter into the flour until dough has a crumb texture. 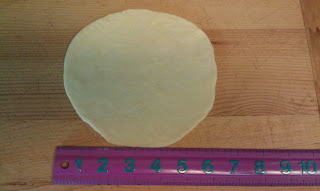 -on a floured surface, using a rolling pin, roll dough balls out to 6 inch circles. 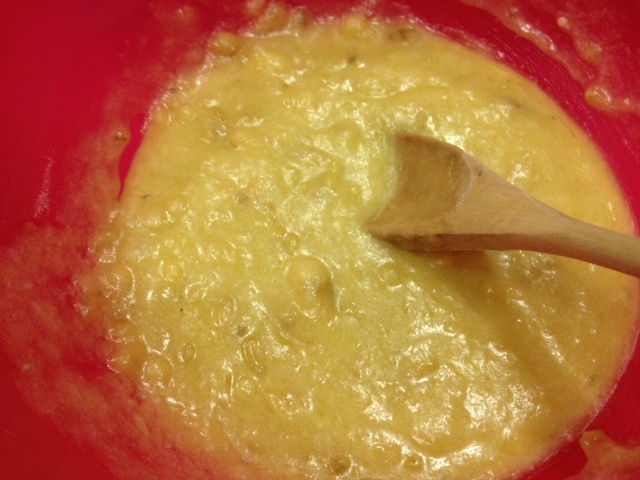 -add 2 -3 tablespoons of filling. -fold in half, press end together tightly. -staring at the left end, using left index finger, start folding over end, then continue to the next section forming a scalloped edge. 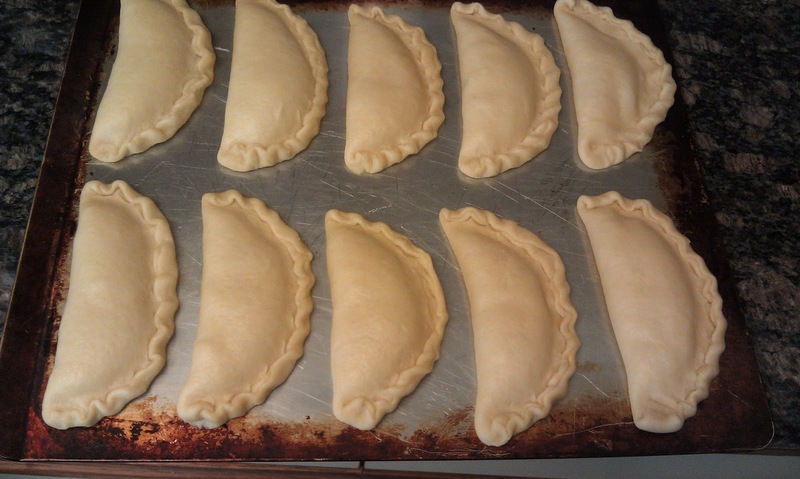 -Once you are done making all the empanadas, combine 1 egg white with ½ teaspoon of water. Beat for 2 minutes. 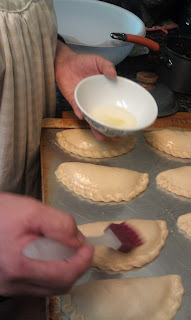 Using a pastry brush, brush each empanada with the egg wash. This will help the empanadas get a nice golden color on top. 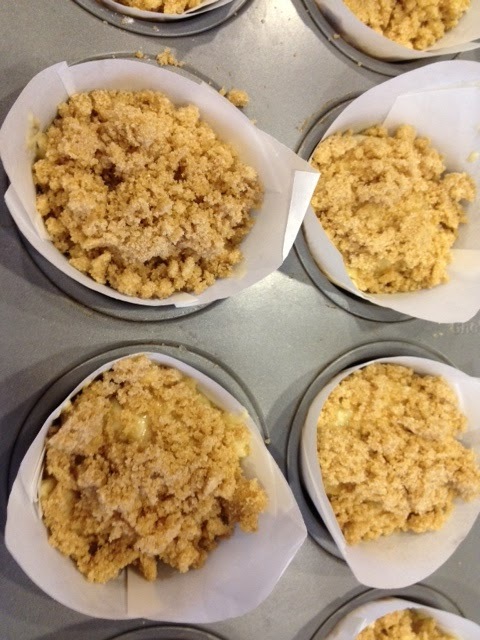 -Bake for 25-30 minutes at 350 degrees until golden brown on top. This is a bonus posting this week because I could not wait one single minute longer to share this recipe with you. Last night at Book Club (I know, sounds geeky, but we actually have a lot of fun) the conversation turned to the topic of food, as it usually does. One of the girls raved about a Martha Stewart recipe for a Salted Toffee Chocolate Bar that her husband calls "Crack". 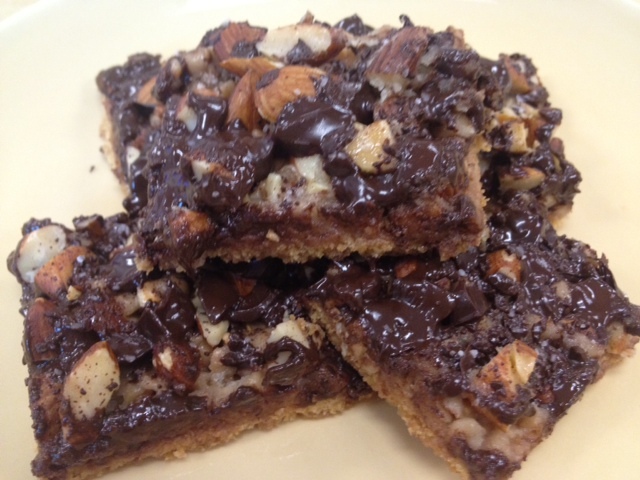 We immediately looked up the recipe and wouldn't you know, I had all of the ingredients to make them in my pantry! I love it when that happens. 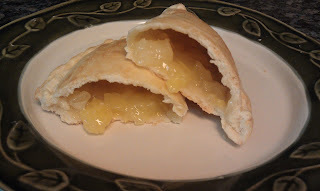 The recipe is so easy and quick, I made some this morning. 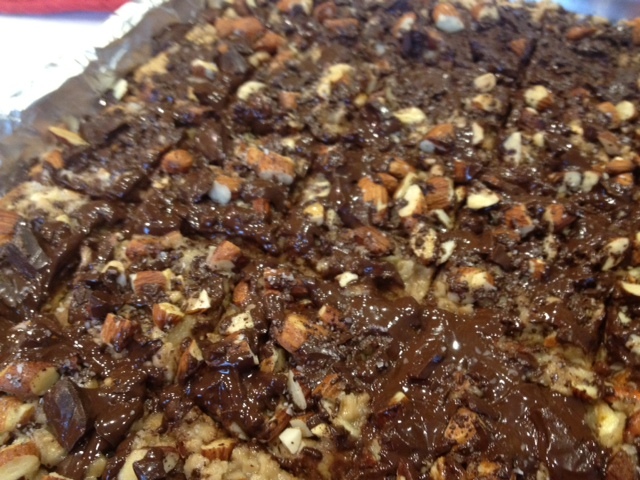 Line a rimmed baking sheet (mine was 17"x 13") with nonstick aluminum foil or spray regular foil with non-stick spray. 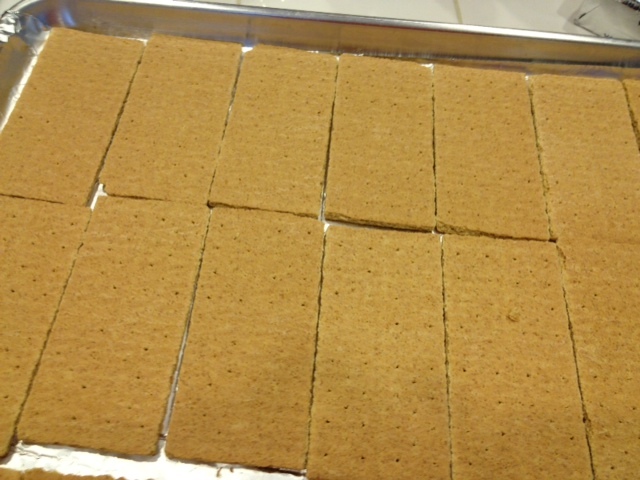 Place graham crackers in a single layer on the baking sheet. 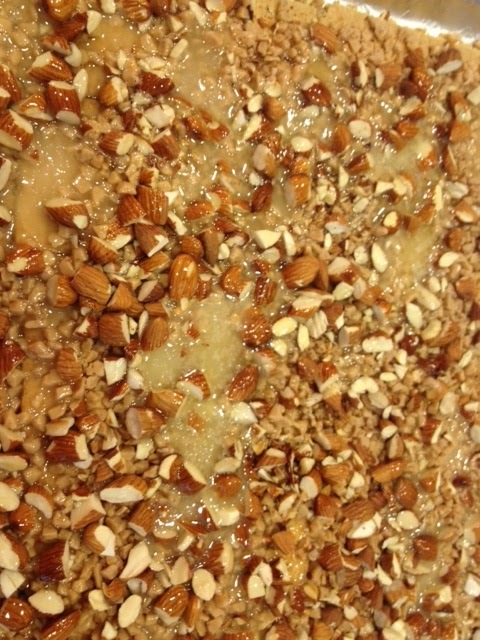 Sprinkle the toffee bits and almonds evenly over the graham crackers. 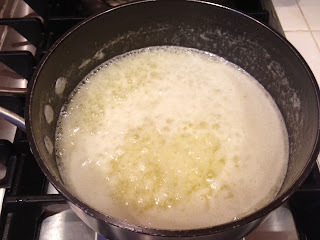 In a medium size heavy saucepan, melt butter and sugar over medium-high heat stirring occassionally to combine and bring to a rolling simmer. 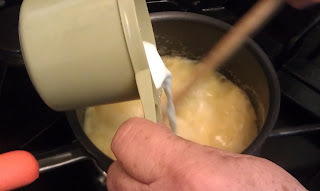 Reduce heat to medium and continue to cook for 2 minutes swirling the pan occassionally to prevent scorching. 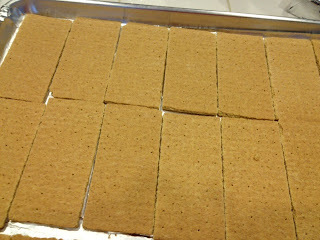 Remove from heat and immediately pour over the prepared graham cracker layer as evenly as possible. 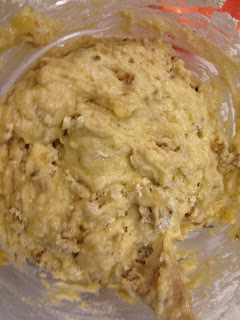 Bake until sugar/butter topping is bubbly (approx 12 minutes). Remove from oven and sprinkle the chocolate chunks evenly over the top. Sprinkle with salt. Today my husband organized a "Farewell" lunch for a coworker who is leaving for Bahrain. Since her favorite dessert is German Chocolate Cake, I offered to make German Chocolate Cupcakes to thank her for her service and sacrifice and wish her well. 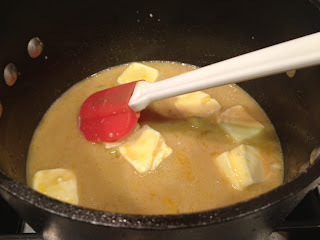 I thought it would be a great idea to post the recipe on the blog today in her honor. I hope she will have the chance to make these cupcakes herself whenever she's feeling homesick and wants a taste of "home". Since German Chocolate Cake can be dry and lacking in chocolate flavor, I use my all-time favorite chocolate cake recipe as the base instead of the traditional german chocolate cake recipe. 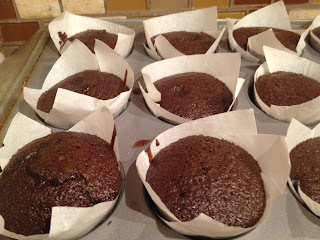 It is dark, moist and full of chocolate flavor, everything a chocolate cake should be. The thing I love most about this chocolate cake recipe is that it actually gets better with age! It is even more moist and the chocolate flavor gets even deeper the next day. It's a great cake recipe to use to make a day ahead and leftovers (if any) taste awesome even several days later! The Coconut Pecan Icing recipe is DIVINE and the best I have ever tried. I could eat spoonfulls of this icing just by itself. 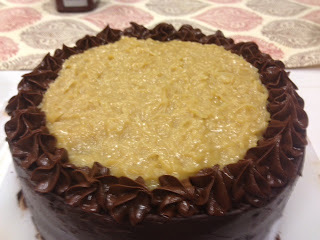 I know most people are not fans of German Chocolate Cake, but this combination won me (a non-german-chocolate-lover) over. 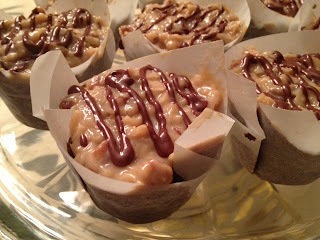 I hope you'll try it for the German Chocolate Lovers (and maybe even convert the non-german-chocolate lovers) in your life! 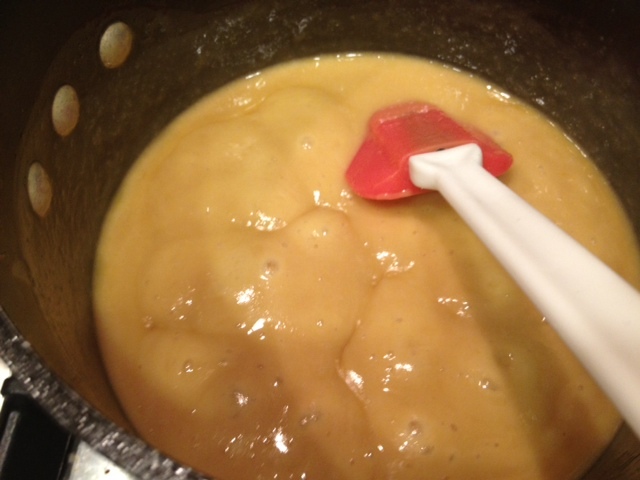 In a medium size saucepan, combine the evaporated milk, egg yolks and brown sugar. Add the butter and cook over medium heat stirring constantly until thickened. This process takes from 8-10 minutes. 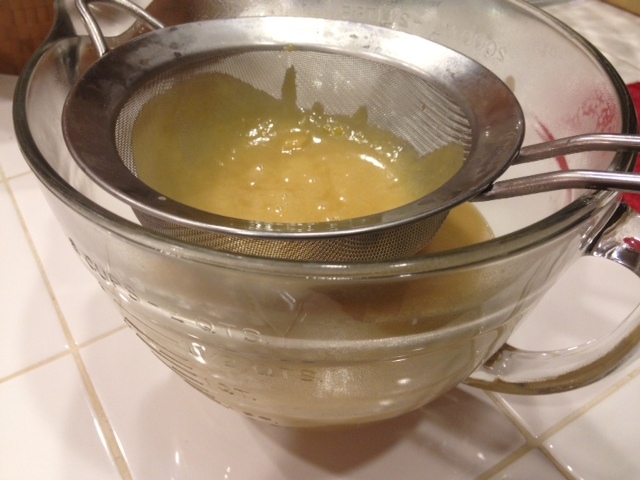 Remove from heat and pour though a mesh strainer into a bowl. 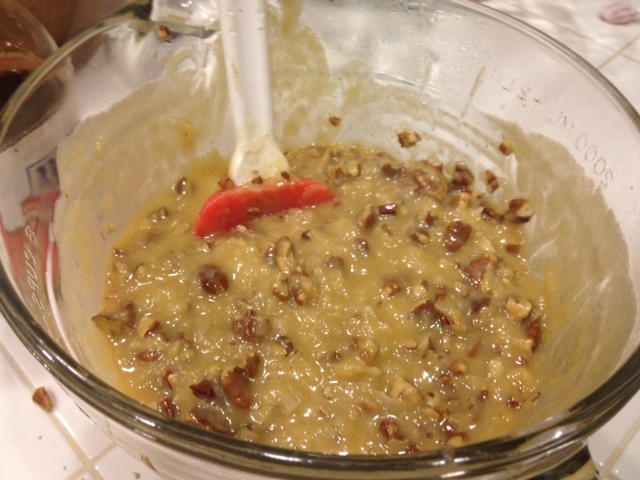 Add the vanilla extract, salt, coconut and pecans and stir thoroughly to combine. 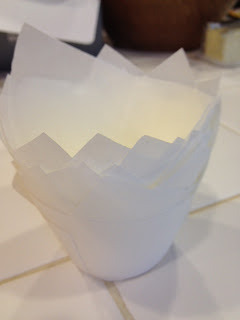 Cool completely to allow the frosting to finish thickening. 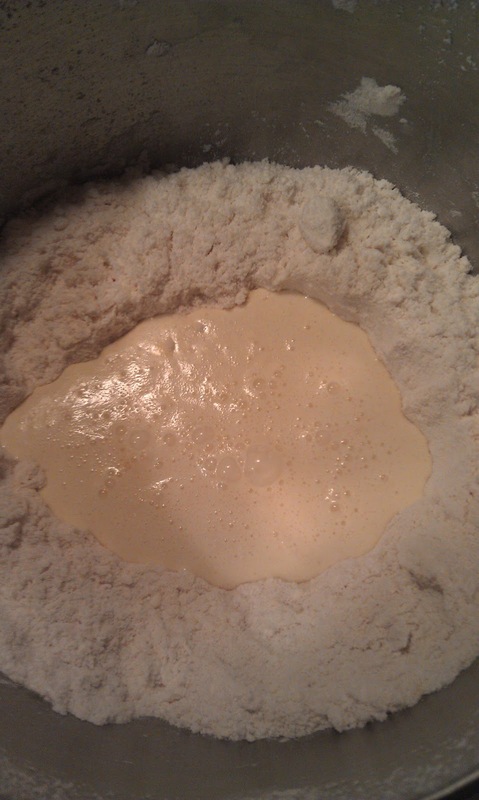 It should become a thick spreading consistency. 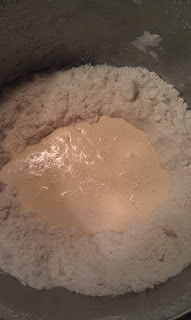 I usually cool mine to room temperature then put in the fridge for a few hours to finish thickening. You can also make it a day ahead. 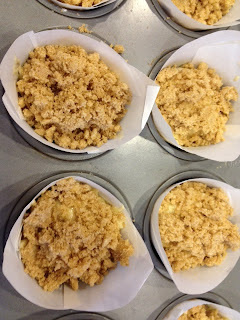 Pour into the prepared cupcake pans (or cake pans if using). 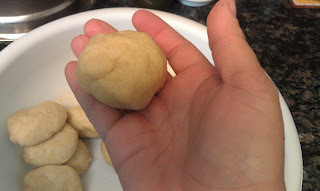 Bake at 350 until done and a toothpick inserted in center comes out clean. Cupcakes usually take about 25 minutes and cake usually takes about 30-35 minutes but all ovens are different so be sure to start checking for doneness around 20-25 minutes into the baking process. 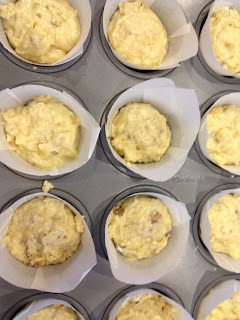 When done, remove from oven and allow to cool in the pan for 10 minutes, then remove to wire cooking rack to cool completely. 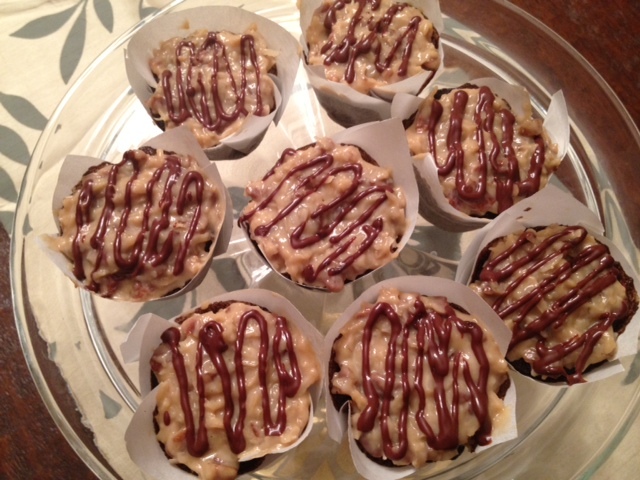 Frost your cupcakes (or cake) with the Coconut Pecan Frosting and decorate as desired. Since I made cupcakes, I just frosted the tops then drizzled with a little chocolate ganache. 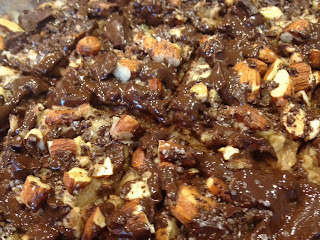 When I make this recipe into a cake, I usually make a chocolate frosting and use the Coconut Pecan Frosting in the middle of the layers and on top.